Two recent reports highlight some of the company's biggest problems moving forward -- and why investors are souring on the stock. 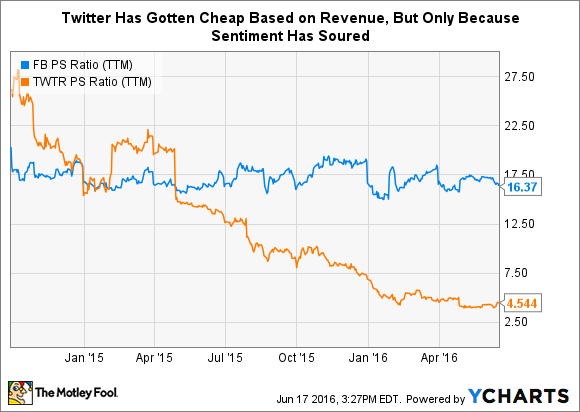 More potentially bad news for Twitter (NYSE:TWTR): Two recent reports show the competition racing by the social media company as it struggles to find its place in the market. First came word that more people are using Snapchat's mobile messaging service every day than use Twitter. Close on the heels of that report came another distressing stat from Comcast polling unit Strata: For the first time, more advertising agencies say they plan to spend their money with Instagram rather than with Twitter. In reaction to that second report, Twitter was defiant, directing a Fortune reporter to earlier surveys that showed Twitter faring better than the photo-sharing site. The Strata results "couldn't be farther from the truth," a company spokesperson told the magazine. "We have close relationships with our agency clients and continue to hear that Twitter offers the most powerful creative canvas." While investors have to be careful not to make too much of individual surveys, anecdotes, reports, or forecasts, this kind of evidence is mounting for Twitter. And these kinds of blanket dismissals have to be wearing thin even on the company's most bullish supporters. It was only last month that analyst firm MoffettNathanson released a searing critique of the company, saying that there is "no compelling reason" to own the stock, other than the possibility that it may be acquired. "In addition, we don't think management grasps the urgency of its situation," wrote analyst Michael Nathanson. Responding to still more damning reports by reiterating that Twitter provides advertisers the "most powerful creative canvas" probably isn't going to change anyone's mind over at MoffettNathanson, and it shouldn't for the rest of us, either. The problems for Twitter are two-fold, and they are highlighted by those recent reports: The company is both failing to appeal to new users as a service, and it's failing to sell itself as a must-have platform to businesses looking to reach people online with advertisements. At the root of both of those issues is strong competition. Facebook (NASDAQ:FB) continues to barrel full-steam ahead, growing quarterly advertising revenue by some 57% over the prior year compared to Twitter's 37%. With its active daily users topping 1 billion, Facebook's user growth will continue to taper. But it's figuring out ways to keep its existing users within its platform longer each visit. On mobile, its average user now spends more than 50 minutes on its properties each day. That -- and an expanding fleet of ad options -- is helping the company attract paying advertisers to its platform. Last quarter, the company said it has some 3 million businesses advertising on the platform. At the same time, Twitter is reckoning with the emergence of new platforms -- namely Snapchat, Facebook's Instagram, and Pinterest. 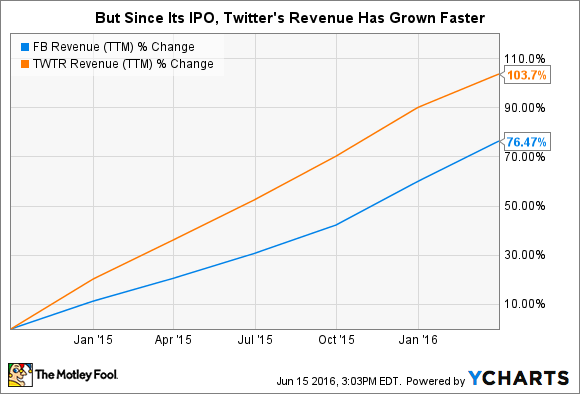 It's not that Twitter's growth overall has been unimpressive. A look at revenue growth since the IPO continues to look strong, even compared to Facebook. But investing is about the future, not the past. And while Twitter's growth in its early days suggests a company headed in the right direction, the evidence continues to mount that Twitter is falling behind. The recent Snapchat and Instagram comparisons add more wood to an already burning fire. The multiples in the chart above shouldn't come as a surprise. Not long ago, Twitter seemed like it might be the smarter bet. It had a smaller user base, but it was better monetizing the users it had. Facebook, even though it boasted a billion users, was struggling to turn those users into revenue. That's changed in dramatic fashion. Industry research firm eMarketer recently scaled back its forecast for Twitter's 2016 revenue, from more than $2.9 billion to $2.6 billion, dropping its expected annual growth from 32% to less than 20%, roughly a third the rate of growth Facebook is now generating. That should trouble investors, and until there are signs of progress, company assertions of having "the most powerful creative canvas" aren't likely to inspire confidence.